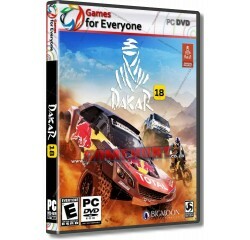 Dakar 18 - R280,00 : Game Hunt, Where we lead, others follow. Cars: Peugeot, Mini, Toyota, Renault, Mitsubishi starring Carlos Sainz, Stephane Peterhansel, Sebastien Loeb, Nasser Al Attiyah, Nani Roma, Orlando Terranova, Mikko Hirvonen, Bryce Menzies, Emiliano Spataro, Carlos Sousa and many others. Quads: Yamaha Raptor starring Ignacio Casale, Sergey Karyakin, Alexis Hernandez, Rafal Sonik Trucks: Kamaz, Maz, Tatra, MAN starring Eduardo Nikolaev, Martin Kolomy, Aleksandr Vasilevski and many others. SxS: Polaris starring Patrice Garrouste, Claude Fournier and many others Huge Cross-Country Open World: driving experience across Peru, Bolivia and Argentina with more than 12,000km2 of open world that doesn't limit you to a track or certain roads Dakar Rally 2018 simulated 14 stages from Lima to CÃ³rdoba. Realistic Graphics: Through the conversion of satellite images on the game terrain Realistic Road Book Navigation System: Simulating the official Road Books of the Dakar Rally 2018 to guide you across that immense landscape where you're free to roam. Can you get to the finish line without getting lost? Processor - Intel Core i5-2400s @ 2.5 GHz or AMD FX-6100 @ 3.3 GHz® or equivalent AMD® processor.